Has Disney been taken for a ride? Drenched in sweat, a rider and his trusty steed gallop across a vast, windswept desert. It is the Ocean of Fire race, a challenge of man and horse against nature, an epic 3,000-mile journey across the burning Arabian sands of the 19th century. Suddenly, a sandstorm bears down on the lone horseman, the swirling desert blotting out the light. This scene is the highlight of Walt Disney's latest epic, Hidalgo, a £50 million blockbuster that opens in April. Disney bosses are typing it as a cross between Raiders of the Lost Ark and Seabiscuit, a real-life adventure guaranteed to thrill adults and children alike. But in recent months, a row has erupted about the truth of the story and whether its charismatic hero, Frank T. Hopkins, played by Lord of the Rings hunk Viggo Mortensen, was a genuine hero or simply a consummate conman who pulled off one of the biggest hoaxes in history. In his diaries, which were discovered in 1951, less than six months after his death, Hopkins claimed to have been the son of an American army scout and a Sioux princess. Born in 1865, he boasted of being the only white survivor of Custer's Last Stand at Little Big Horn, Montana, in 1876, and of becoming a Pony Express rider aged 12. By 20, Hopkins says he was a star of Buffalo Bill Cody's Wild West show and, in his spare time, he claimed to have taught frontier lore to Billy the Kid. Oh, and he was shot seven times and bitten by a rattlesnake three times. But it was his most fanciful tale that gripped the imagination of respected screenwriter John Fusco, who first read about Hopkins ten years ago. The story claims that the cowboy and his trusted mustang horse left the vast wilds of America to compete in a legendary 68-day race across 2,860 miles of Arabian desert - and win. According to Hopkins, the race, which had been held for 1,000 years, pitted the finest Arab thoroughbreds and Bedouin riders against each other. 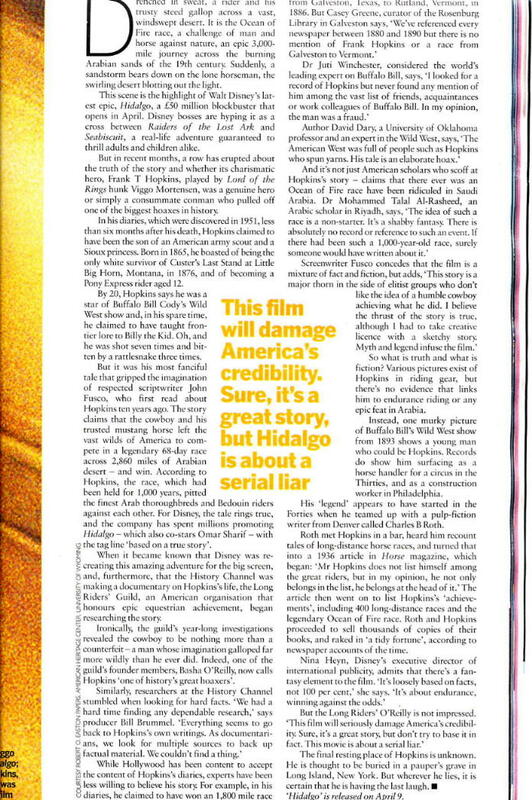 For Disney, the tale rings true, and the company has spent millions promoting Hidalgo - which also co-stars Omar Sharif - with the tag line 'based on a true story'. When it became known that Disney was recreating this amazing adventure for the big screen, and, furthermore, that the History Channel was making a documentary on Hopkins's life, the Long Riders' Guild, an American organisation that honours epic equestrian achievement, began researching the story. Ironically, the guild's year-long investigations revealed the cowboy to be nothing more than a counterfeit - a man whose imagination galloped far more widely than he ever did. Indeed, one of the guild's founder members, Basha O'Reilly, now calls Hopkins 'one of history's great hoaxers'. While Hollywood has been content to accept the content of Hopkins's diaries, experts have been less willing to believe his story. For example, in his diaries, he claimed to have won an 1,800 mile race from Galveston, Texas, to Rutland, Vermont, in 1886. But Casey Greene, curator of the Rosenburg Library in Galveston says, 'We've referenced every newspaper between 1880 and 1890 but there is no mention of Frank Hopkins or a race from Galveston to Vermont. So what is truth and what is fiction? Various pictures exist of Hopkins in riding gear, but there's no evidence that links him to endurance riding or any epic feat in Arabia. Instead, one murky picture of Buffalo Bill's Wild West show from 1893 shows a young man who could be Hopkins. Records do show him surfacing as a horse handler for a circus in the Thirties, and as a construction worker in Philadelphia. His 'legend' appears to have started in the Forties when he teamed up with a pulp-fiction writer from Denver called Charles B. Roth. Roth met Hopkins in a bar, heard him recount tales of long-distance horse races, and turned that into a 1936 article in Horse magazine, which began: 'Mr. Hopkins does not list himself among the great riders, but in my opinion, he not only belongs in the list, he belongs at the head of it.' The article then went on to list Hopkins's 'achievements,' including 400 long-distance races and the legendary Ocean of Fire race. Roth and Hopkins proceeded to sell thousands of copies of their books, and raked in 'a tidy fortune', according to newspaper accounts of the time. The final resting place of Hopkins is unknown. He is thought to be buried in a pauper's grave in Long Island, New York. But wherever he lies, it is certain that he is having the last laugh. 'Hidalgo' is released on April 9.